The first visit to this building site involved a steep hike from the road to the top of a limestone ridge. At the time, the property was overwhelmed by dense buckthorn. 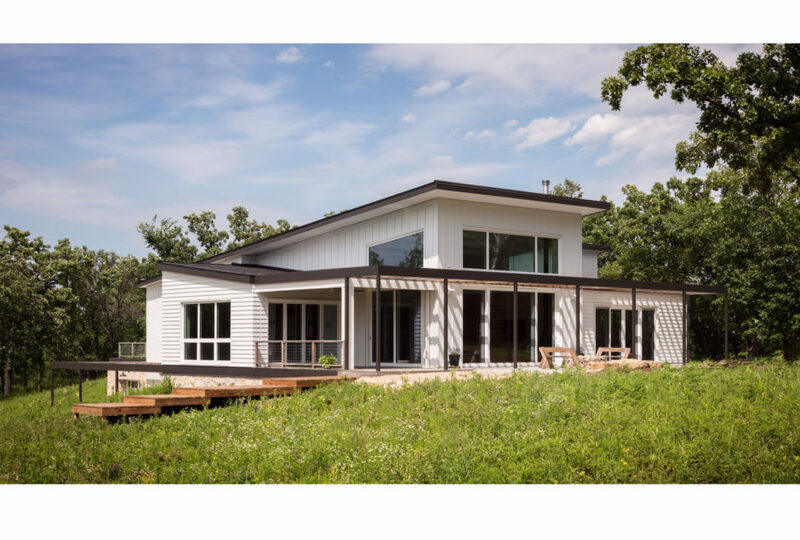 The homeowners became stewards of the land, restoring the landscape to a native prairie. Once the tall weeds were cut back and burned away, a singular sculptural oak tree became a focal point at the top of the ridge. The location for the house ultimately found a natural position, nested into the sloping ridgeline, rooted on axis with the “home tree”. 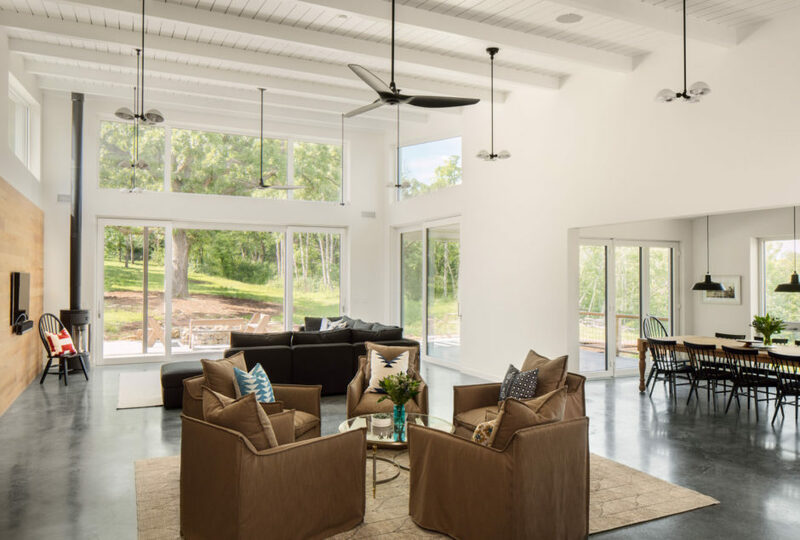 The living spaces enjoy expansive views to the top of the tree and dramatic vistas over western farmlands. 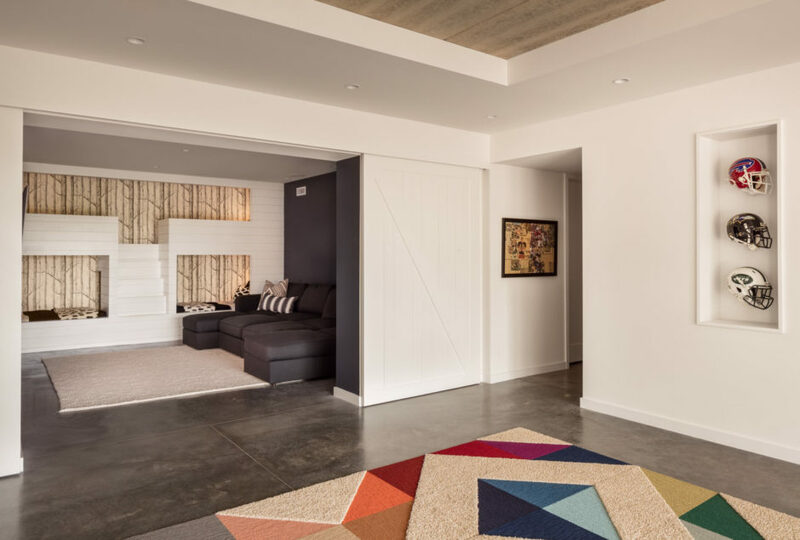 The house was designed for a growing family who enjoy entertaining larger groups. The architecture is a combination of influences and materials that hold special meaning to the family. 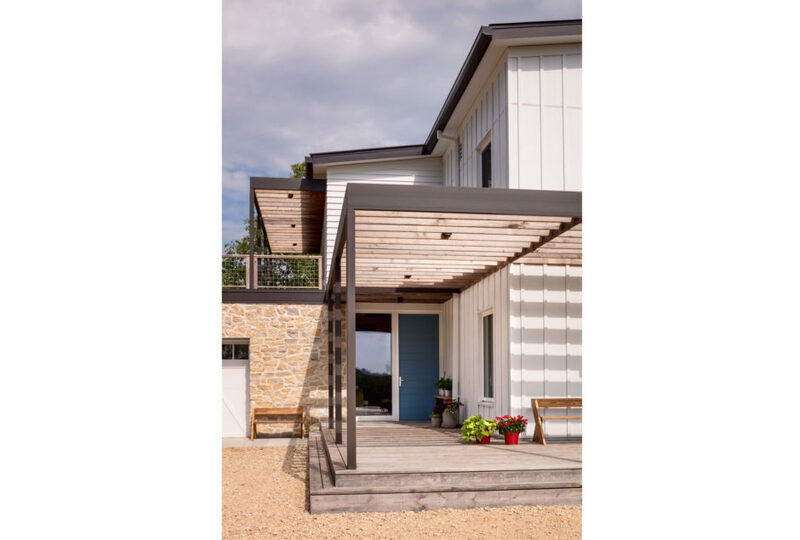 Limestone foundation walls and board & batten siding reference Wisconsin’s vernacular barns. 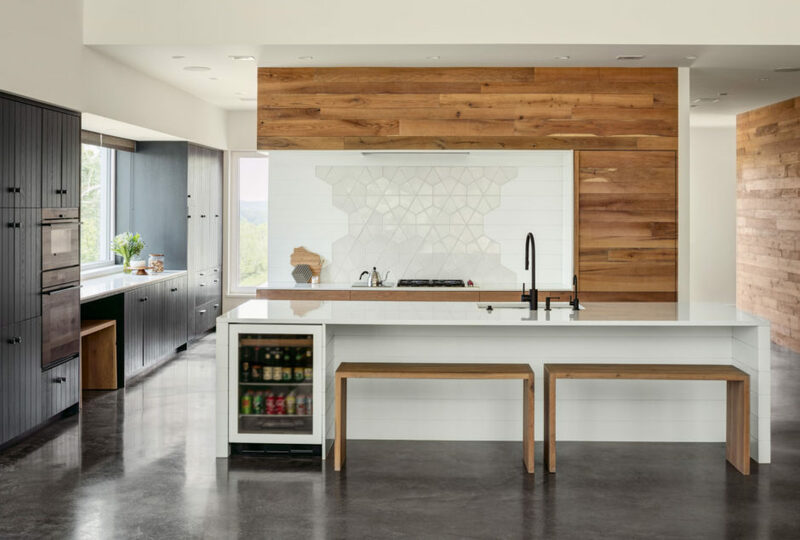 Polished concrete floors, a minimal interior palette, and gracious connections to the outdoors recall fond memories spent in a California vacation home. 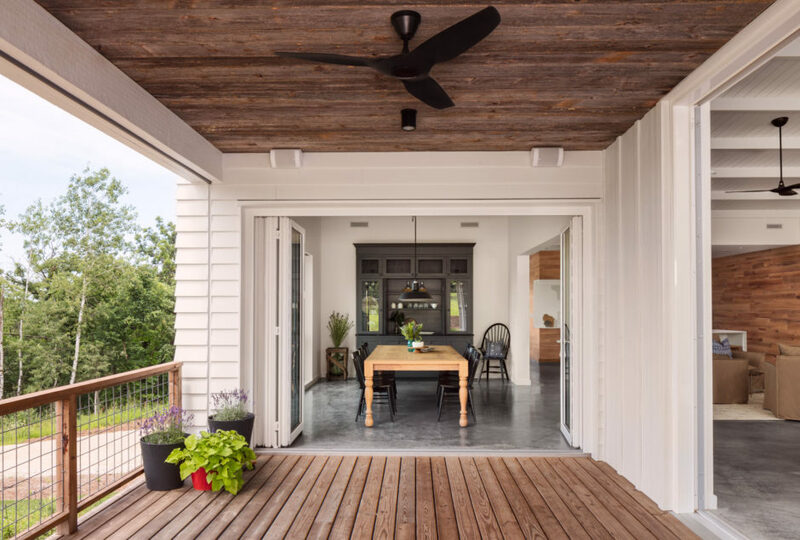 Decks and trellises crafted from thermally modified pine reference southern wrap around porches and provide a structured place to gather outdoors in a sea of prairie grasses. 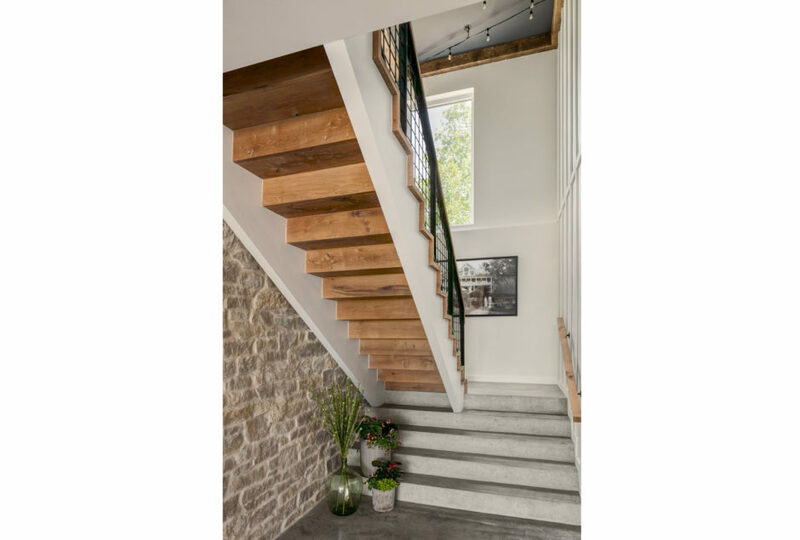 The home’s interior wood walls and staircase are crafted from site-harvested oak trees that were cleared during the construction of the 300 foot long driveway that climbed 150 vertical feet from the road to the ridge. 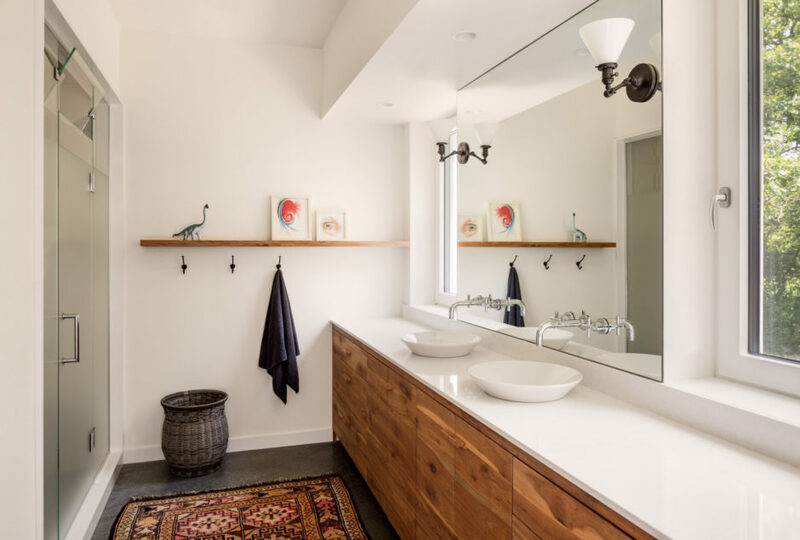 The millwork in the master bedroom and bathroom is from site-harvested cherry trees. 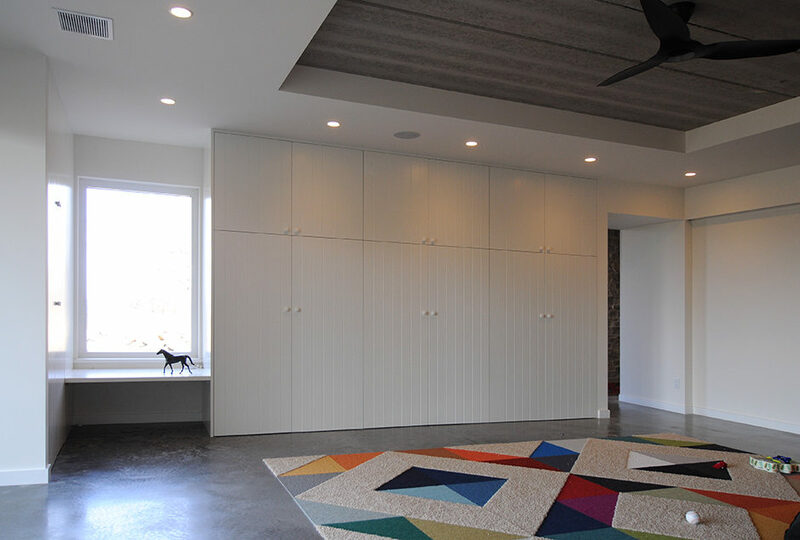 One of the homeowners was directly responsible for the interiors, specifically designing the custom millwork in concert with the contractor’s carpenter. 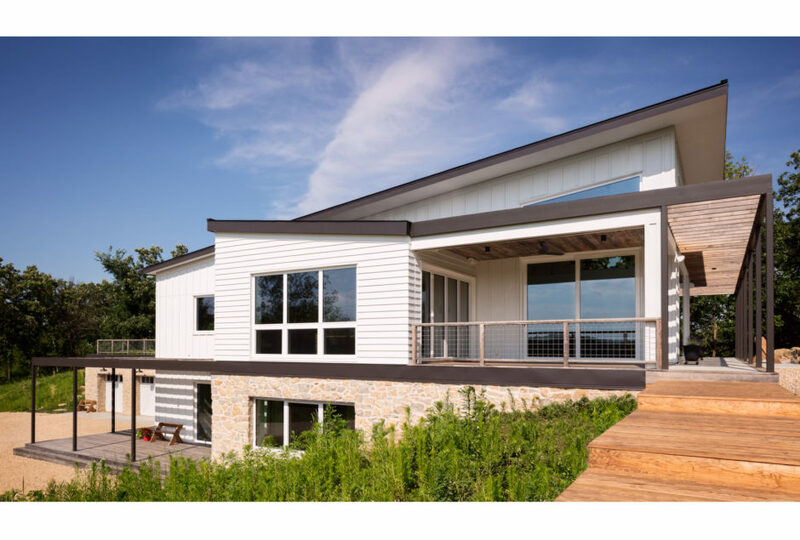 The architecture belies numerous modern energy efficient strategies modeled after the Passive House Standard. The design aims to lessen long-term energy demands through high-performance building assemblies that will remain in place for the lifespan of the building, without the impetus to invest in renewable energy systems. 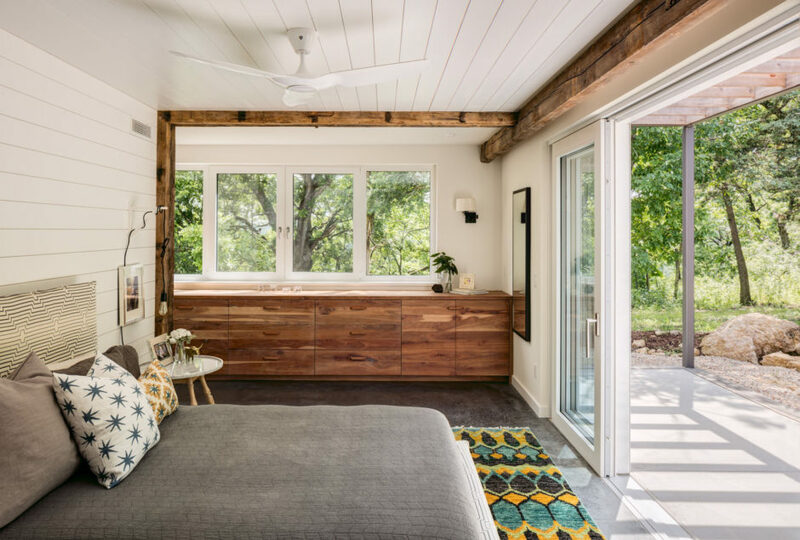 The living spaces and master bedroom benefit from passive winter solar gain with external summer shading provided by the trellis. High-performance triple glazed European windows and doors enhance comfort with R11 insulated glass. Wall insulation is R38, roof insulation varies from R65-R85, sub-slab insulation is R30. 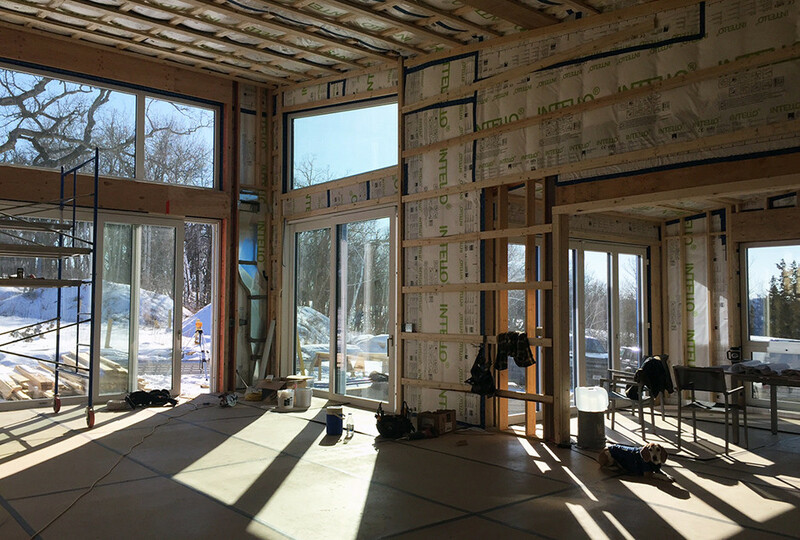 But the most important feature is thermal bridge-free detailing, achieved with 3” of continuous external insulation (mineral wool above grade and XPS below grade) The house features zoned radiant in-floor heat, and mechanical energy recovery ventilation which provides double the required ventilation rate. 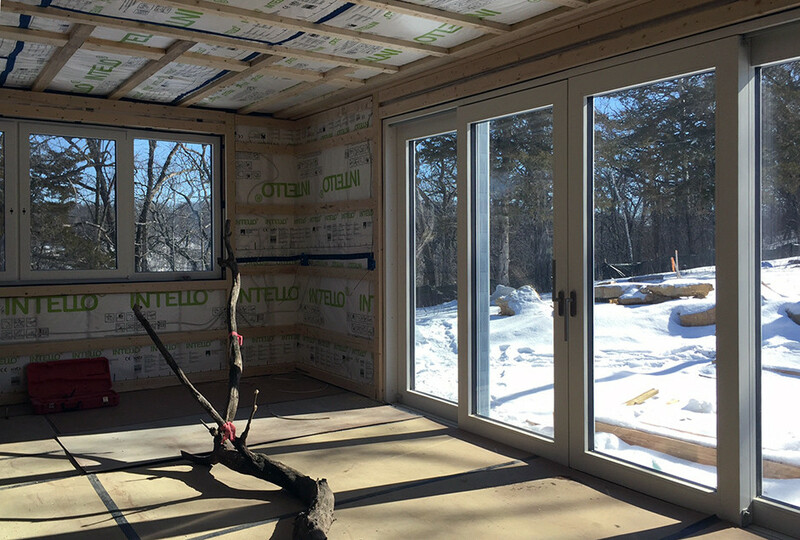 Attention to air-sealing through careful detailing and construction resulted in a blower door test result of .47 ACH @ 50 Pascals which beats the Passive House Standard! 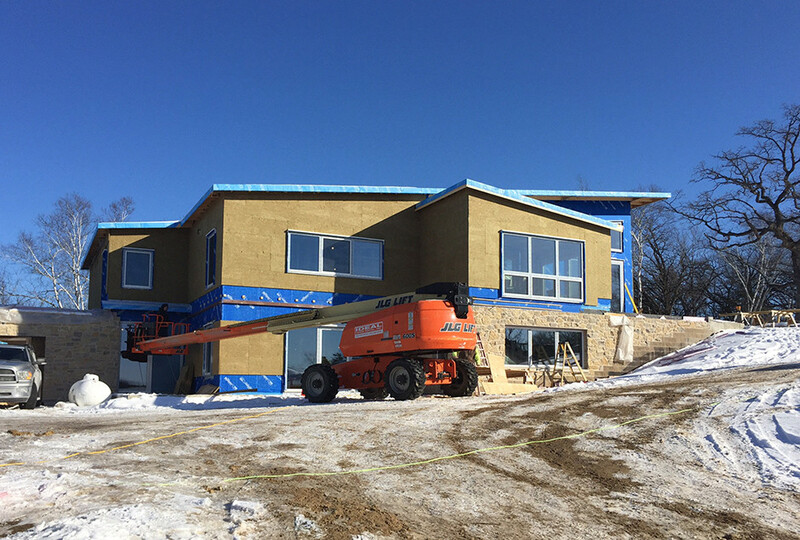 The house has been certified to be 60% more energy efficient than current code. The house was a collaborative design/build project that demonstrates a synthesis of form and function.